Our next retreat is on June 7th-9th 2019 so save the date in your diary for this brilliant event. 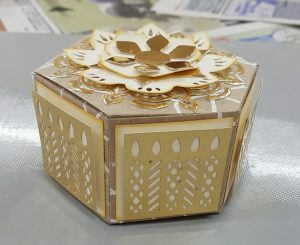 At this craft retreat we offer 7 different paper craft based workshops. For those who arrive on the Friday there is a social evening. 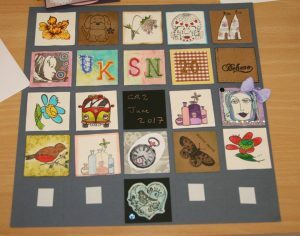 At craft retreat 2 you book your own accommodation, there is a Travel Lodge and a Premier Inn fairly close to the venue. Lunch, refreshments and all workshop materials are included in the price, which is £50.00 for the weekend. Dinner is separate which is a Chinese takeaway. Closer to the time we will be sending out a “what to bring list”. This is a weekend full of craft, chat, cake and more craft. 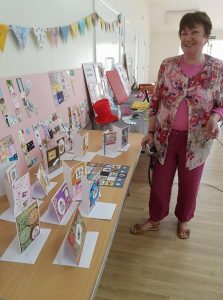 As always we will have our Raffle, Secret Summer Santa Sack, Button competition, Craft Celebrity board, The look what other crafts I do table, a Preloved stand and a Card competition, Die cut exchange, Scrap and Share exchange, and a door prize!!! Don’t forget there is a discount when you book both retreats!!! 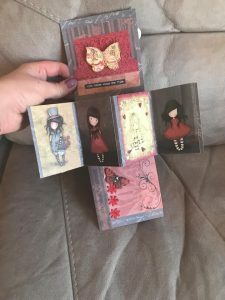 In this workshop we will be making a small mixed media Gratitude journal. 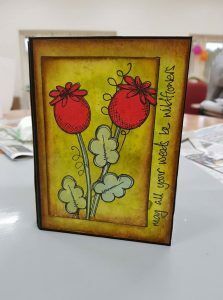 Mickey Woodcock will be taking you through different mixed media techniques to create a small journal that you can write in the big and the small things we have in our lives to be grateful for. 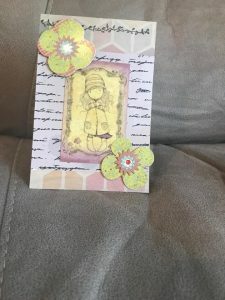 You’ll be creating some inspirational handcrafted “stickers” and have the options of decorating your pages with washi tape. This will be a journal you’ll just love to write in. Need a card to give to that really special someone in your life? 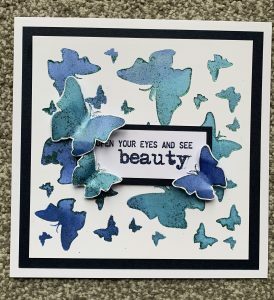 Sue Tossell is our stencil queen and will be showing you how to make a beautiful card using stencils, alchemy waxes and sparkle medium. 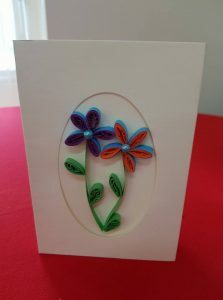 Nicola Brown just loves her mixed media and she will be guiding you through how to make a picture frame that is decorated with realistic handmade paper flowers that you will make using a flower quilling die. Add a special photo and you will have a lovely gift or a beautiful addition to your mantle piece. 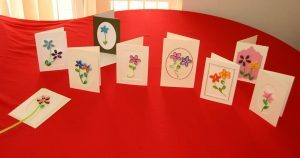 To finish off our first day we will be making cards that are given away to our elected charity. We will be playing Sheila Jordan’s consequences but look out for a surprise twist this year. 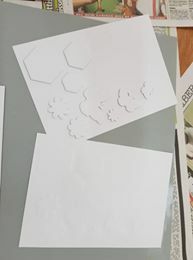 This is of course an optional workshop but it’s going to prove to be a lot of fun as well as making beautiful cards for charity. We all love to keep up with the latest trends and products. 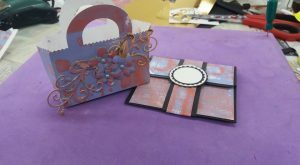 Join Ina Carney in making cards using the new wreath builder concept which is currently taking the crafting world by storm. It uses all those tiny stamps that you thought were too small to make anything effective. 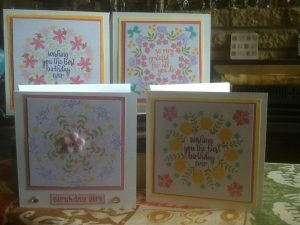 In eight quick and easy steps using the templates provided, you can have the perfect card for any occasion by adding the greeting of your choice in the centre circle. 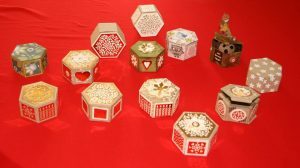 As we all know there are many different aspects to papercraft. 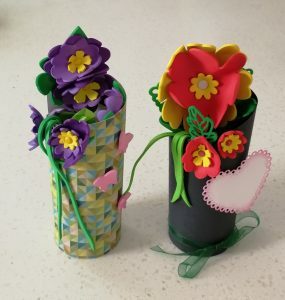 Jo Wyles will be showing you how to make a paper vase which you can put some funky handmade flowers in or use it to hold your paintbrushes. 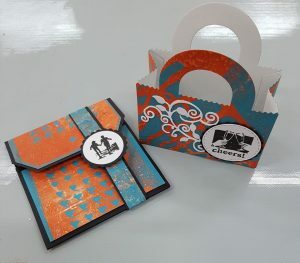 Whatever you choose to put in it, it will make a lovely addition to any crafters desk. Sue Renshaw will be showing you how to make a really cute yummy interactive card for that coffee lover in your life. 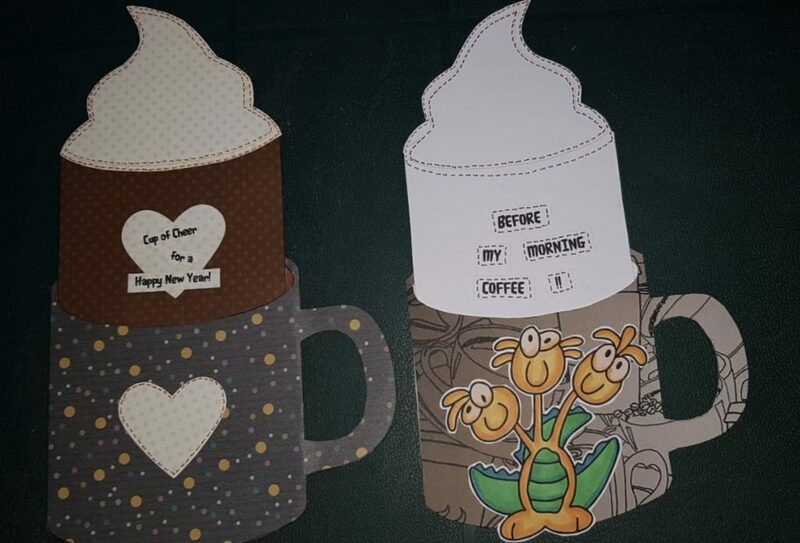 Don’t have a coffee fan to give it to? 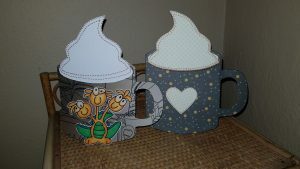 How about hot chocolate or even a cuppa tea, this card can be adapted to any of these beverages. Places go quick for our retreats and are limited so book your place. Below is some of the techniques and work that took place at CR2!